Marijuana activists, some of them sharing a few joints, gathered in front of the State House Wednesday, June 21, to protest the House marijuana bill scheduled for discussion that day. The Senate debated its own pot bill on Thursday, and conferees to work out a compromise bill were appointed Friday. BOSTON — ZAP! BUZZZZZZZZ! That was the sound of the Massachusetts House and Senate touching what for years has been considered a politically hazardous “third rail” subject: marijuana. 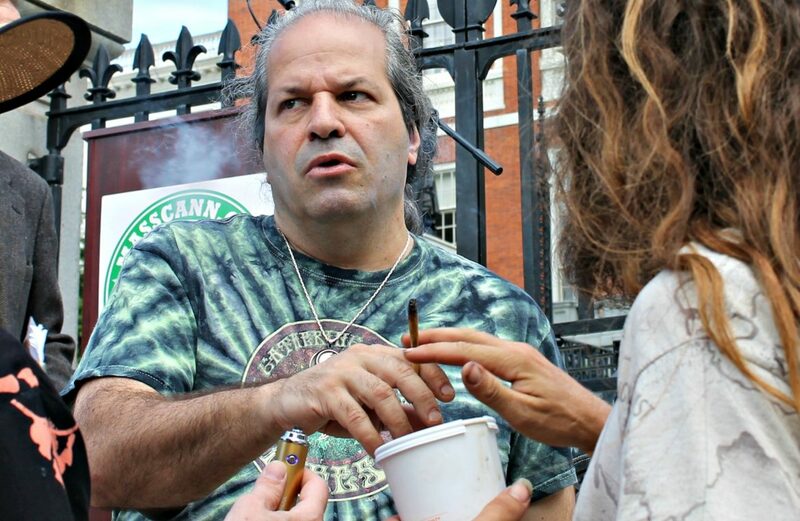 The Legislature did what it has refused to do for years last week — talk in public about the leafy green intoxicant — but only because voters forced Beacon Hill’s hand and did the hard part of legalizing cannabis on their own. For lawmakers who thought activists were just blowing smoke all these years, the events of recent days were a reminder that ultimately, the voters call the shots. About a year before voters legalized marijuana themselves, Senate President Stanley Rosenberg, D-Amherst, explained why, to that point, only one senator had agreed to serve on a special committee to study marijuana and why Beacon Hill avoided the sticky-icky ganja. “Drugs are a third-rail issue in politics, and you don’t want to associate with it publicly because just studying it is enough for people to say, ‘Oh, he must be in favor of it because he is studying it,’ and people just avoid drug-related stuff,” he said. The sudden zeal to alter the law drew the ire of activists, and like birds of a feather, various pro-marijuana factions flocked outside the State House to rail against legislative tweaking last week. Hoping to up the public pressure on lawmakers, a ballot campaign official even deputized those in the hazy crowd as “ambassadors of cannabis” who swore an oath to lobby their elected officials. Inside the State House, it was mostly silent on Wednesday morning, as both branches did the bulk of their work in the afternoon and evening hours. By the time the House got to work, on the longest day of the year, reps did what everyone’s mother would have yelled at them for: They sat around inside all day. The House gaveled in Wednesday at 11:45 a.m., but the first of the 118 amendments filed to the pot bill wasn’t taken up until 5 p.m.
Away from the House chamber, leadership sorted through the amendments and often determined their fate — puff, puff, pass — as the reps who filed them were bouncing around the room and satisfying their munchies with Swedish Fish and Twizzlers. 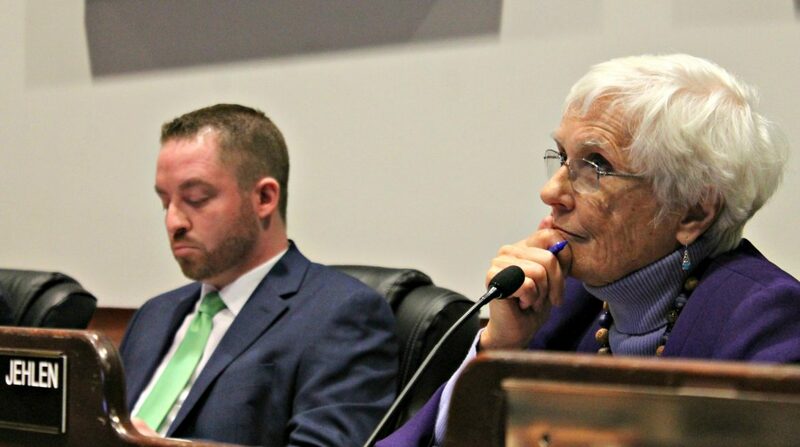 The Marijuana Policy Committee was co-chaired by Rep. Mark Cusack and Sen. Patricia Jehlen. In the absence of real debate, some reps became restless. Rep. Kate Campanale, a Republican from Leicester, tweeted Wednesday afternoon, “So we just sat around for about 30 minutes doing nothing, and then we were called to recess. So glad that this process is efficient …” She later deleted the tweet. Eventually, at about 9:40 p.m., the House did vote — by a margin of 126-28 — to pass its marijuana law rewrite and hand it off for the Senate to take a hit. When the Senate gaveled in shortly after 11 a.m. Thursday, the House was still bogarting the bill, giving it one final review. “I know that we eagerly await the arrival of legislation relative to the control of the adult recreational use of marijuana in our chamber as it is being finally processed in the chamber down the hall,” Senate Minority Leader Bruce Tarr, R-Gloucester, said, interrupted by Rosenberg banging his gavel. By noon, the Senate had begun working through the 111 amendments proposed and wrapped up its work Thursday night at about 9:15 p.m.with a 30-5 roll-call vote. The reconstruction of a law passed by nearly 1.8 million Massachusetts voters will be finalized by just six lawmakers [see below] who are tasked with hashing out a pot law that’s built to last. The first question the conference will have to answer is whether they are going to keep the ballot law — Chapter 334 of the Acts of 2016 — as a skeleton and “amend and improve” it (as the Senate says its bill does), or are they going to repeal and replace the voter-backed law, which the House bill does. The House’s 28 percent and the Senate’s 12 percent tax rates will likely be reconciled with the Goldilocks method — one’s too high, the other too low, so settle on something in that “just right” middle ground. Working through the issue of local control may be a bit stickier for the committee. The Senate maintained the ballot law’s requirement that a city or town can only ban marijuana facilities by a town-wide referendum, but the House gave that power instead to local elected and appointed officials. Their compromise bill will have to clear both branches one last time before going to Gov. Baker for his signature, or amendment. The particulars of the Legislature’s marijuana overhaul are now in the hands of six lawmakers tasked with reconciling the House and Senate bills by the end of the month. In rare Friday sessions, the House and Senate appointed House Majority Leader Ron Mariano of Quincy, Shrewsbury Rep. Hannah Kane, Braintree Rep. Mark Cusack, Somerville Sen. Patricia Jehlen, Belmont Sen. William Brownsberger and Plymouth Sen. Vinny deMacedo to a conference committee to work out differences between the two bills (H 3776/S 2097). Conference committees generally meet in secret, negotiating a consensus bill that is then placed before the two branches for delivery to the governor’s desk. Cusack and Jehlen are co-chairpersons of the Committee on Marijuana Policy. The House and Senate diverged on taxation, with House lawmakers hiking taxes on regulated pot sales to 28 percent while the Senate stuck with the 10 percent to 12 percent tax approved by voters in November. On other matters, such as governance of the yet-to-be-assembled Cannabis Control Commission and support for small-scale growers, the two branches were in closer alignment. The House bill would make it easier for local governments to ban the industry from communities, and the Senate added a provision for people to clear their criminal records of offenses that are now no longer a crime. Without many other bills to show for themselves, lawmakers have made rewriting last year’s ballot law an early session priority, planning to have a bill ready for Gov. Baker’s review by the end of June, with hopes that retail marijuana establishments can start opening by July 2018. Voters, who decriminalized marijuana in 2008 and legalized its use for medical purposes in 2012, last fall passed a law legalizing possession, cultivation and regulated sale of the drug to adults 21 and older by about 54 percent to 46 percent. Baker said earlier in the month he had “no doubt” lawmakers would send him a bill by the end of June. Moulton and other Democrats last week were adjusting to the fact that, despite galvanizing against President Donald Trump, they came up short in a race for an open U.S. House seat in Georgia that many analysts viewed as a referendum on Trump and the state of play of party politics. Here’s what’s really inside #Trumpcare. The state Senate next week plans to debate a bill prohibiting drivers from holding cellphones while behind the wheel, a major expansion of the texting-while-driving ban established by a 2010 law. An order adopted by the Senate last week teed up the bill for deliberations on Thursday, June 29, and set a deadline of 5 p.m. tomorrow for senators to file amendments to the bill (S 2058). Last session, a version of the distracted-driving bill cleared the Senate on a voice vote but never progressed beyond an initial approval vote in the House, which was a graveyard for a host of bills passed by the Senate in 2015 and 2016.